An optimal start to the Rolex Swan 45 World Championships in Cala Galera (Argentario) organised by the Yacht Club Italiano and the Circolo Nautico e della Vela dell'Argentario (CNVA) in partnership with Rolex. The day got off to a good start with the skippers' briefing at 0900 on the terrace at the CNVA and just before midday the 17 teams participating, from eight nations, headed out into Gulf of Argentario. The first start was at 1300 with 5-6 knot winds from the south. 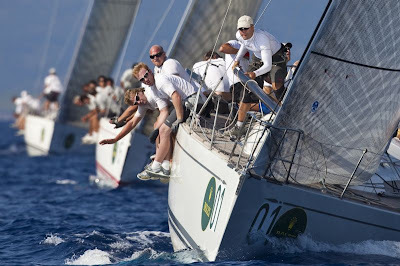 It was the Finnish team of Tea Ekengren-Sauren onboard Blue Nights who were first at the top mark, closely followed by 2008 World Champions Earlybird (GER) who quickly took the lead followed by Fever (GBR) and Carlo Perrone's Atlantica Racing, the first Italian team. 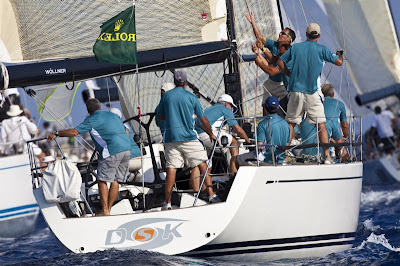 At the leeward mark it was Nico Poons' team onboard Charisma (NED), with tactician Ray Davies (Team New Zealand) who moved into first place for the rest of the race, while Earlybird and Fever finished second and third respectively. As the afternoon progressed, the wind shifted to the West and built to eight knots in time for the start of the second race at 1450. 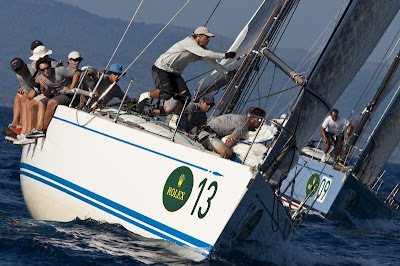 Grant Gordon and Klaus Diederich's FEVER, winners of IRC-1 at the Giraglia Rolex Cup, were strong off the start line and led the entire race. In second place and Ishida's Yasha (JPN), followed by Earlybird. 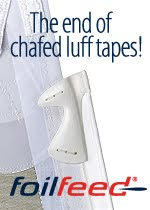 At 1625, the wind unexpectedly picked up to 10 knots and it was possible for the Race Committee to get in a third race. 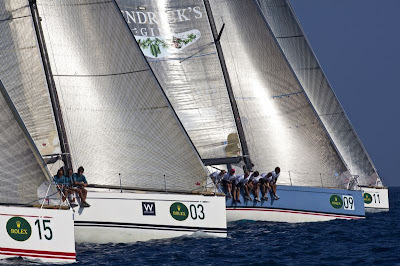 World Champions Earlybird were once again the team to beat and it was the Dutch on No Limits, helmed by owner RW Bol in second at the first windward mark. Earlybird kept the lead and won the race followed by No Limits, Ulika and Atlantica Racing.